Two years ago, I offered to take on the responsibility to set up and manage a series of conferences on ‘Diversity and Inclusion’ on behalf of the British Chamber of Commerce for Italy. Over the following eighteen months I had the opportunity to work with amazing people, among them an inspiring British diplomat, that happened to be gay, an enlightened entrepreneur, that happened to be twenty-one years young, a esteemed and gracious policewoman, that happened to be transgender and quite a few talented managers that happened to be women. At every conference the speakers walking on stage would open new windows on everyday life and offer attendees new and surprising perspective on ordinary issues. 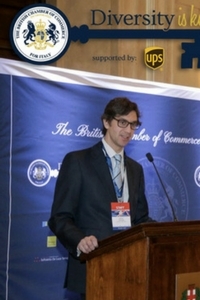 The experience for each of the participants, including the speakers themselves, proved to be inspirational and invigorating; so much so that the British Chamber decided to extend the series for another year and push the envelope even further by moving the focus towards the issues of ‘dis-abilities’ and chronic diseases. But let’s take a step back, and look at the topic of women, an issue that has been object of innumerable initiatives, campaigns, marches and focused legislation. Women’s rights are not a novelty, nor have they evolved so quickly that they would justify decades of efforts to overcome them. After giving it much thought I have matured a theory. My theory is that addressing women’s issues as such is flawed on various levels, hence its limited success in definitively overcoming the issue. First of all, women’s issues are not issues ‘of women’. They are issues, because men are part of the equation, otherwise the issues would cease. I’m obviously not saying that it’s men’s fault that our society is having considerable difficulties with unleashing women’s full potential in the workplace, it’s a relationship issue and as with all relationship issues, it inevitably requires the active engagement of each of the parties involved if the issue is to be resolved. The second reason why I think these issues should not be addressed as women’s issues is that each woman is different. Though some of the issues may be felt by a majority of women, we need to realize that sexual harassment, work-life balance, leadership by authority have brutal impacts on many employees that are not female. Just think of how a young introverted man might feel when facing his charismatic, 60-year-old, alpha male CEO, or how an ethnically diverse lawyer in a court room today might be penalised by his heritage, or how unequipped companies are, and how challenging career paths must be for a single father who must attend to his children while satisfying the expectations of a traditional work environment. These issues should not be labeled as women’s issues any longer. Lastly, we must recognize that the power struggles, prejudice, miscommunications and difficulties in getting alternative approaches taken into serious consideration, hindering many women’s contribution to a company’s value creation, are not limited to women. We need to stop preaching to the choir. If at the next Women Leadership seminar you are speaking to a room full of women, where men are less then ten percent of the audience, it is likely that you are hammering a nail in the sand. Also, it’s time to engage the workforce as a whole, and to do that the first step is changing our vocabulary and stop branding outdated leadership models as misogynous. This practice is backfiring against women and preventing all the men that would stand to benefit from change, from joining the peaceful revolution of our workplace. Consumers today expect companies to reflect the values being taught in school and promoted by mass media. Though there are still plenty of examples of women being objectified and gay men being taunted, fortunately there are also many wonderful examples of business embedding Diversity and Inclusion (D&I) in their core values, and in everyday practice. Often these examples appear where you would not expect them. You see them in traditional companies like Banca d’Italia, which has had a D&I program for many years, highly competitive law firms like Hogan Lovells, which is continuously engaged in LGBT initiatives, or Lloyd’s of London that, through its first ever female CEO, is advancing inclusion with ground breaking projects. The examples are everywhere and they accelerating in their growth. Most importantly, this contagious thirst for an ever more inclusive environment is proving a phenomenal way to release untapped internal resources, to access new markets, increase efficiency and attract loyal customers. Diversity is key and there are greater benefits for those that lead this positive and fast growing social trend.